Casio AWGM100-1A.Casio AWG M100 with increased resistance to impact G-Shock. 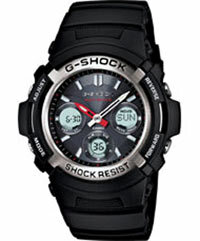 Casio AWG M100 with increased resistance to impact G-Shock. Radio controlled time with the function of Multiband, always ensure precise time anywhere in the world. Up to 5 daily alarms can be set on this model G-Shock. LED backlighting guarantees good legibility even in darkness. An interesting option for silent mode function is MUTE, which will slake watch beeps when pressing buttons.